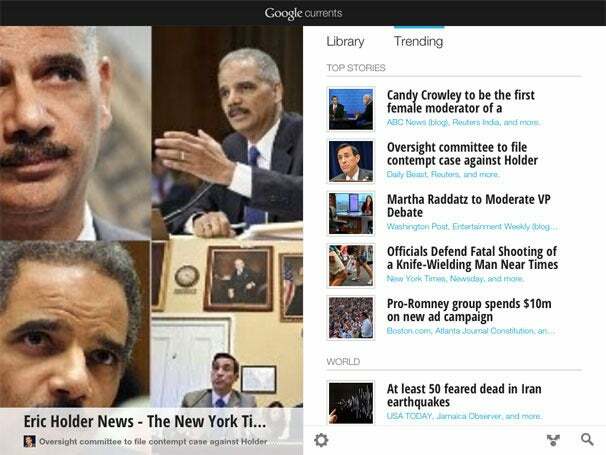 Google Currents, the free news-reading app for iPhone and iPad, is elegant and useful. But the app from Google suffers from a perplexing failure to integrate more fully with Google’s RSS-reading service. Like other news-reading apps—most notably Flipboard—Google Currents displays headlines in an attractive magazine-style layout that users can flip through, stopping to tap on a headline and read a story more deeply. In the News: The trending feature in Google Currents shows top headlines in several different categories. You can choose your news sources several different ways. The app has a “trending” feature that shows five top headlines in several different categories, such as world news, sports, and entertainment: You can choose which categories you want to see displayed. The other option—and the one you’re more likely to use—is to build your own library of news sources. You can do this from the hundreds of feeds that Google provides in cooperation with website publishers—sources ranging from Slate to Huffington Post to Der Spiegel to popular blog sites—whose stories are featured in layouts native to app. The number of such sources far exceeds what you’ll find in the similar Yahoo Livestand app, but some major publications like the New York Times aren’t available as native feeds. You can also import individual RSS feeds from your Google Reader account; you’ll see the headlines and story summaries featured in the same magazine layout the app’s native sources, but you’ll read the actual stories in an in-app browser. This feature can be irksome, however. You can import individual feeds from your Google Reader, but not folders of feeds. Flipboard does let users view Google Reader folders; it’s odd that Google would be outperformed in offering access to its own features. Otherwise, this is a very nice news-reader with useful features. (You can even sync it before boarding a plane, in order to read the stories when you’re offline later.) It’s just the rare Google product that needs more Google.